Many suppliers helped the Peugeot 5008 earn a top score of five stars in the European New Car Assessment Program (EuroNCAP) test. Robert Bosch GmbH supplies electronic stability control, which comes as standard equipment. TRW Automotive Inc. delivers steering wheels, airbags and seat belts. Both the passenger and driver airbags are a new smaller design. The driver airbag has a smaller diameter while the passenger airbag has a new "minipack" design that weighs 25 percent less than the previous version. TRW also provides seat belts with a new pre-tensioner. Faurecia SA developed an exhaust heat recovery system in collaboration with parent PSA/Peugeot-Citroen SA. The system uses what would otherwise be waste thermal energy to warm the vehicle's interior and further heat the engine to a more efficient operating temperature. This heating process is 25 percent faster than traditional systems. AGC supplies the vehicle's glazing, which is among the largest in the Peugeot range. The front windshield has an area of 1.70 square meters, while the optional panoramic glass roof covers 1.69 square meters. 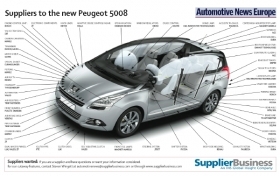 Peugeot initially expected 20 percent of the 5008s that it sold to have the panoramic sunroof but 60 percent of buyers have purchased the option. Johnson Controls Inc. supplies Peugeot with its award-winning head-up display for the 5008 five- and seven-seat minivan and also for the 3008 crossover. The display projects important driving metrics -- including speed, cruise control, speed limiter and the distance alert -- onto a transparent plastic panel instead of onto the windshield. The display improves safety by reducing the amount of time the driver has to look away from the road to check instrumentation. JCI also supplies the 5008's modular seating system, which can be adjusted to increase storage capacity. For example, the front passenger seat and second-row seats can be folded into floor, creating a level surface. The supplier contributes a variety of other components, including the headliner, body control module, tire pressure monitoring system and battery. The 5008 debuted at the 2009 Frankfurt auto show with a choice of four diesel and two gasoline engines. Peugeot builds the 5008 at its Sochaux plant in France. Prices start at 21,850 euros in France.